WW | Oh, hello thirty. For as long as I can remember I have struggled with my weight. Not so much with losing weight. I am really good at losing weight. The problem is I am even more proficient at gaining weight. The truth is that if calories were not an issue I would routinely choose to eat completely terrible food all the time. I’m not talking Burger King or McDonalds, but I am talking homemade burgers, tons of desserts, ice cream and bacon, egg and cheese sandwiches every day of the week. Couple my natural lust for all things fatty and delicious with a scary habit of comfort eating when life gets a little stressful and I wind up gaining and losing the same thirty pounds over and over and over again. I’ve recently re-entered “weight-loss mode.” What that means in my household is a re-commitment to cooking healthy homemade meals and an increase in exercise. I am lucky enough to have a star Weight Watchers leader for a sister so I also use the WW program as a guide for my daily food intake. My sister recently reintroduced me to WW’s latest weight-loss tool – the ActiveLink fitness and activity monitor and I am in love. This little gadget is amazing. Technically speaking it is a 3-Way Accelerometer, which means it tracks the body’s motion forwards and backwards, up and down and side to side. 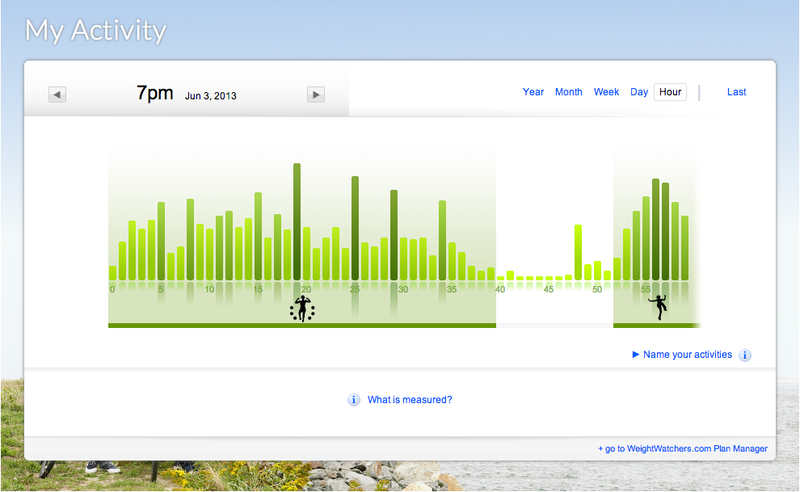 Effectively what it does is measure and track your movements throughout the day. After a short assessment period it allows you to set a goal to gradually increase your activity level over several weeks. With a simple glance at the monitor you can get a rough estimate of your movement during the day. By plugging it into your computer (it’s actually a USB drive, crazy!) you can see a detailed hour-by-hour or minute-by-minute breakdown of how much you are moving – below are examples from my day yesterday. Let me tell you – this baby is the most inspiring fitness tool I have discovered in ages. It might be that I am completely Type A and love a good goal, but I am 150%, totally, completely obsessed. I love to watch my progress throughout the day and I find it incredibly satisfying to meet and exceed my goals for each day and week. (My sister the WW Star has been warning me that my goals may be a little low if I keep exceeding them. She may have a point, but I’m so happy with the satisfaction that I’m not willing to up them quite yet.) 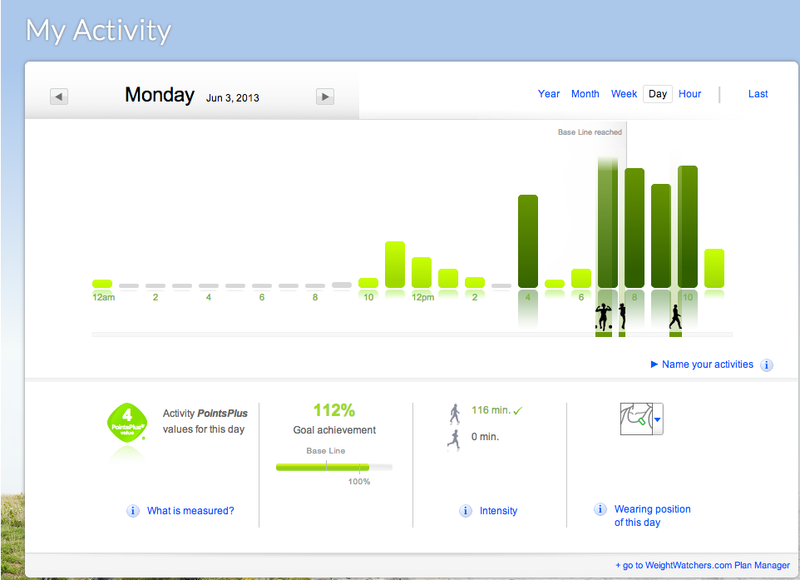 I find myself doing crazy things to up my activity level – running the stairs in my apartment building, standing while working, even doing jumping jacks in the living room. The most interesting thing that I’ve discovered is that a workout alone is not enough to meet my goals. I have a generally sedentary job and if I don’t make a concerted effort to move during the day even a killer workout won’t put me over the top. If you’re thinking about getting more active I would highly recommend the Active Link. If you aren’t a WW member there are also several other options although I can’t personally vouch for them. I’ve heard great things about the FitBit and Up by Jawbone. Have you worn a fitness monitor? What are your favorite tricks for getting more active?